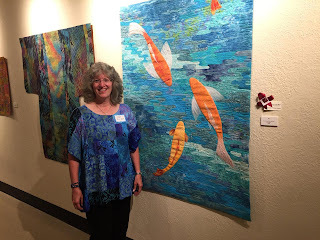 This is Sarah Ann Smith with her quilt "Koi" at the Out of the Blue exhibit at the Whistler House Museum of Art. Her quilt won the Viewers Choice award and has been purchased. I also had two pieces in the exhibit, and Sarah was kind to let me post these pictures from the opening. My "Blue Squares" quilt is in the photo below just left of the doorway.